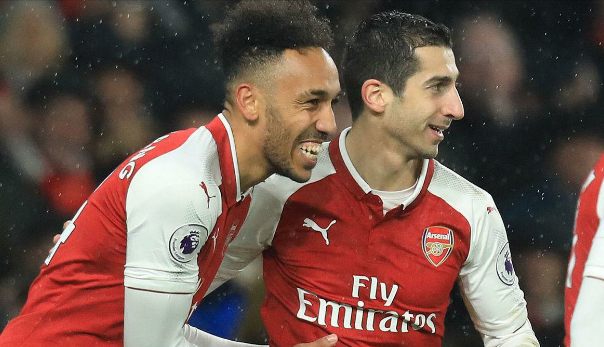 Pierre-Emerick Aubameyang and Henrikh Mkhitaryan dazzled on their Emirates Stadium debuts as Aaron Ramsey's hat-trick led Arsenal's unceremonious 5-1 thumping of Everton. By the time £56million recruit Aubameyang displayed his midas touch in front of goal, Arsene Wenger's side were already three goals to the good and cruising on account of Aaron Ramsey's first two strikes, which came either side of a Laurent Koscielny header. Mkhitaryan set up the Wales international's opener and also laid on Aubameyang, his old partner in crime at Borussia Dortmund, for a goal on his maiden Premier League appearance, although the offside flag should have ruled that one out. Arguably, a defensive showing as abject as the ramshackle interpretation offered by Everton in the first half deserved such ill fortune. On-loan Manchester City centre-back Eliaquim Mangala suffered a debut ordeal and deflected Ramsey's second past Jordan Pickford, while Sam Allardyce's pre-match assertion that Arsenal were defensively weak came back to bite him brutally and repeatedly. Everton improved after the break – it would have surely been impossible to do otherwise – and substitute Dominic Calvert-Lewin reduced the arrears before Ramsey claimed the match ball from Mkhitaryan's third assist.